If you consider yourself as a strong and advanced skier, then you should definitely try your skills at one of the following Alpine ski resorts, offering challenging ski routes to bump up your adrenaline! Chamonix is one of the world’s finest and oldest resorts, great skiing hotspot, situated in the French Alps close to the borders of Switzerland and Italy, offering a multitude of enjoyable slopes for all levels – long slopes, skiing through the trees, freeride and off-piste skiing, everything a skier or snowboarder can dream of! The Chamonix Valley consists of 5 ski resorts – Les Grands Montets, Les Houches, Le Tour/Balme, La Flegere and Le Brevent – and welcomes winter sports lovers throughout the year. The Mont Blanc, the highest mountain in Western Europe (4,810 m), is dominating the Chamonix area and beckons extreme sports enthusiasts – paragliding, extreme skiing, ice climbing – it’s got everything! 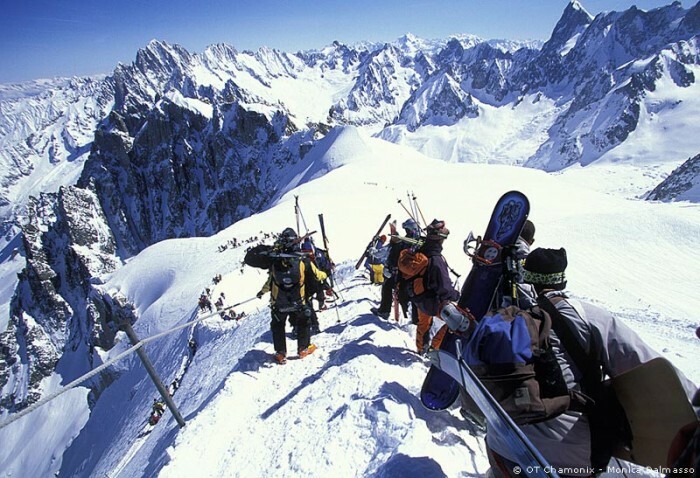 The Chamonix includes 170 km of pistes and a number of red and black runs. Despite the reputation of “the death-sport capital of the world”, the resort is perfect for families with kids – there are several slopes for children and a team of professional and experienced instructors ready to help the kids learn to ski. Expert skiers will definitely have a blast above Argentiere at Les Grands Montets, ski area featuring long vertical and exceptional snow quality. Thanks to it’s advantageous position, the resort can be easily reached by private airport transfer from Chambery, Geneva and Lyon airports. Choosing Chamonix as your winter ski destination, you will experience classic European lifestyle and the oldest ski resort culture. St. Anton, located in the heart of Arlberg region within two hours’ of three international airports, is a true gem in Austrian skiing’s crown, one of the snowiest areas in Europe, so called motherland of Alpine skiing and first ski school, created in 1920’s by Johann ‘Hannes’ Schneider. St. Anton boasts 340 km of pistes, 180 km of off-piste itineraries and over 55 km² of challenging off-piste terrain. In addition, it has a highly efficient lift system and an attractive town bursting with stylish hotels, chalets and restaurants to make your stay as pleasant and enjoyable as possible. St. Anton provides two distinct skiing areas – Valluga and Rendl valleys. Valluga valley attracts more advanced skiers and those who enjoy off-piste challenges. This is also the highest point (2,811m) accessible by lift offering a breathtaking panoramic views of the Eastern Alps. The Rendl valley is less crowded and suits intermediate skiers and beginners who want to develop their skills. St. Anton is a true paradise for kids as it offers a superb children’s ski school and youth center, as well as non-skiing activities, restaurants and hotels where kids are more than welcome. Being one of the top ski resorts in the world, St. Anton is renowned for its vibrant night party atmosphere, après ski bars and pubs, nightclubs and entertainment. In St. Anton parties never seem to stop so everybody is happy and entertained. St. Anton has plenty of restaurants and good dining options offering a multitude of different cuisines. Alpe d’Huez, another French ski resort for advanced skiers, also known as “l’ile au soleil”, is the sunniest part of the French Alps. Here, you can enjoy the sun virtually 300 days a year! Situated in the region of Haute Alpes (southern part of the French Alps), the resort attracts snowboarders and skiers, especially those ready to challenge black runs and steep slopes. If you are an advanced skier, freeride deep snow terrains, mogul slopes and extremely difficult steep runs will not disappoint you. Looking for adrenaline? Try the black Tunnel, run beneath the Pic Blanc glacier (3,330 m), or enjoy La Sarenne, a 16 km long black run from the top of Alpe d’Huez. Die-hard skiers can maximise their time on the slopes with a spot of night-skiing, practicing their turns in the Signal Slalom Stadium or once a month, tackling the 16km Sarenne run by the light of the moon. The resort has a fantastic selection of non-skiing activities on offer, from ice driving to ice skating on the Olympic-sized ice rink, from dog-sledding to paragliding. Alpe d’Huez offers a range of 60 restaurants. You can also find some amazing food being served up on the hill.